Mr. Jair Bolsonaro, the leading candidate for the upcoming Presidential Elections in Brazil, was stabbed during a campaigning event, suffering serious abdominal injuries. Luckily he was able to be transported to a nearby hospital quickly and according to the latest reports, he will be able to make a full recovery. One of the surgeons, Dr Borsato stated that a two-hour procedure stopped the serious internal bleeding and they were able to repair most of the damage from the knifing. 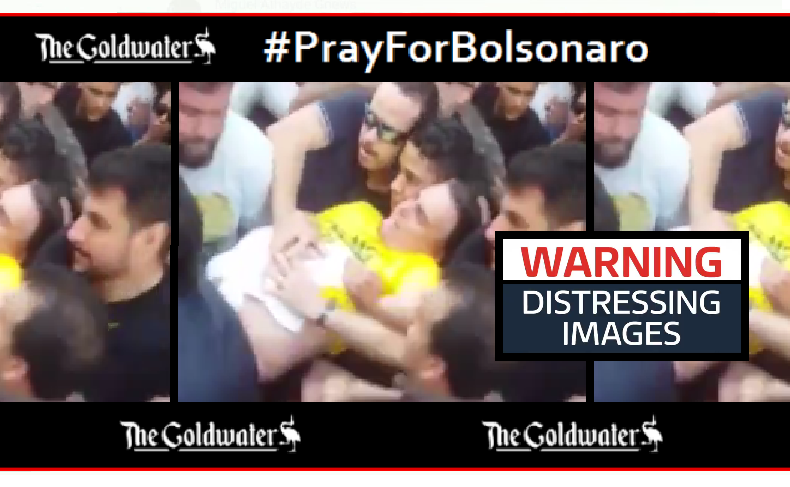 Related coverage: <a href="https://thegoldwater.com/news/36341-Brazil-The-Attack-Strengthens-Bolsonaro-Video">Brazil - “The Attack Strengthens Bolsonaro” (Video)</a>. Mr. Bolsonaro will need further surgery within months as a part of his intestines has been temporarily fixed with a colostomy, the surgeon said. “But in the first hours after the surgery, his recovery has been very satisfactory. Mr. Flavio Bolsonaro, the candidate's son, stated moments ago that "sadly, it was more serious than we had hoped for." "The perforation reached part of his liver, lung, and intestine,"
"He lost a lot of blood, arrived at the hospital … almost dead. He appears to have stabilized now. Please pray!" Brazil goes to the polls on 7 and 28 October. Mr. Bolsonaro, often referred to as the ‘Brazlian Trump,’ was leading the polls. We here at thegoldwater.com wish him a speedy recovery. He underwent surgery and is stable. He regained consciousness and filmed a small video speaking to the population. The situation is still dangerous but the doctors seem confident on his chances. Please keep praying for him. There are strong indications that more than one person participated in the Bolsonaro assassination attempt. At least 3 more people were arrested or being investigated.